The Bible class titled “Practical Christianity” has been completed. Some of us have been challenged to make changes in our lives. As if the word “practical” really means to apply the principles in our life. We have continued our private study and discussions of applications outside the classroom. Someone suggested that we try to help other interested christians and that we find a way to concisely convey the lessons we learned. Here is my first attempt at a brief overview. Our American culture (even within churches) and Jesus are much more different than we originally thought. Remember, the Jews didn’t get it, the multitudes didn’t get it, and His closest disciples didn’t get it. Does the description of the early church in Acts characterize us? Huge difference. Our resources (money, time, physical energy, and emotional energy) are wasted on vain, worldly things. We are called to be good stewards and to bear fruit. Drastic changes are needed in the way we live. We are called to be holy (set apart from common things for a special purpose). Given our inherent limits, we must choose that which is better over that which is good. We are called to be wise. Start small with a single step…and then take another. We are called to be like God and it requires that we learn about Him and, through a growing process, begin to think like Him and act like Him. 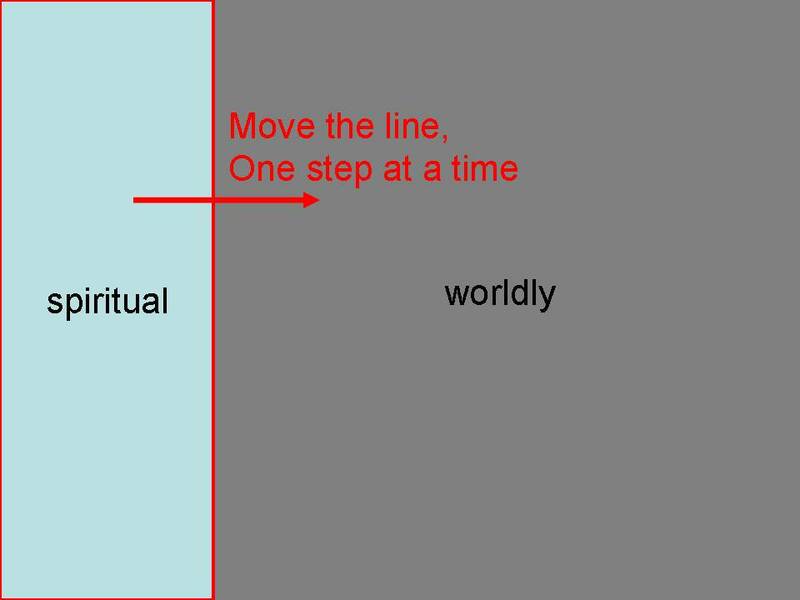 If the box below represents our heart and the way we live, we’ve got to increase spiritual living and reduce worldly living. To be the light of the world, we need to be very different from darkness. Get your sunglasses ready, I’m ready to shine.